If you are looking for a quick read to put you in the Christmas spirit, Melody Carlson's "The Christmas Shoppe" is just the book for you! Matilda purchases a store much to the dismay of many residents as this is on Main Street and neither the store's wares or Matilda have the right "look" for this area of town. Susanna, new city manager, is trying her best to do a good job and keep everyone happy at the same time. Susanna is not only trying to keep peace with the council members, but also her mother-in-law in line as well. When Susanna's mother-in-law and daughter begin to spend time with Matilda and form a bond with her, Susanna realizes that this may be more difficult than she thinks until she ventures into the shoppe herself. This town is filled with people who are hurting, seeking for something or needing to find peace and/or forgiveness in regards to their past. No one would have guessed that Matilda is helping each person to heal when he or she walks into her shop. This is a very quick read, but it is filled with charm! The characters are all such interesting people and while they all try to put on a good front, they are really hurting and needing something. What they each need is found in Matilda's shoppe and each person's story is shared a little bit more with the reader. There is so much packed into this story and you will finish the book feeling happy for the characters and also thinking what you would pick up if you happened to come upon Matilda's shoppe yourself! 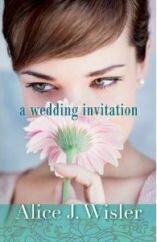 Alice J. Wisler's "A Wedding Invitation" is more than just a tale of a wedding, but a tale of new love, and a reconnection with a love from the past and family relationships. Samantha received a wedding invitation in the mail on a cold, blustery night and the outer envelope is blown away. Upon arriving at the wedding and not knowing anyone, not even the bride who she thought was her college friend, Samantha ponders her options. Deciding to stay, Samantha spends quite a bit of time with another guest, Taylor, and this begins a relationship between the two. Samantha also reconnects with Carson, another teacher with whom she worked years ago at a refugee camp. Carson brings back memories for Samantha and also past hurts. Meeting up with a former student forces not only Samantha and Carson to work together, but these two along with Taylor. This story has many layers to it. Samantha and her mother work together in her mother's high-class clothing boutique. There relationship is a large part of this story as well as Samantha's relationship with her Aunt Dovie. The differences between the aunt and mother are interesting as well. The book goes between the present time in the story (1993) and 1985 when Samantha and Conner are working together. The past adds much to the story and gives a lot of extra insight into their relationship and why it is what it is. This is a well-written and well-developed story. Serita Jakes' novel, "The Crossing," is a thought-provoking, heart-wrenching, all too real read that will have you hanging onto every word and turning pages. Claudia is reliving the moment that her friend and cheerleading coach was murdered on a school bus on the way home from a football game. Claudia has been for the past 10 years. Claudia's husband wishes to solve this crime and unravel the mystery that surrounds this incident as a means of helping Claudia move on and work through the tragedy. What he does not know are the secrets that are buried and twisted within this tragedy as well. Casio is now a police officer, but he was wounded while traveling on that bus that night as a football player. Casio is dealing with this incident still as it has lead to him having anger management problems and ultimately ruining relationships in his life now. This is a story that keeps on turning and changing keeping the reader guessing and on the edge of his or her seat! This story is so realistic and the aftermath for individuals and communities are very real. The characters are suffering from PTSD, anxiety, anger, and fear. Do not expect a pleasant read, but yet one that is very real and you will become a part of the character's lives and the daily struggles that they deal with. Deanna Rutledge, pastor's wife, brings her expertise, observations and compassion for the body of Christ alive in her novel, "Random Souls." A church is not just the building a group of people meet in to worship God, the church is the group of people. However, not every group of people or church are immune to tension and friction among of the members. Welcome to Aloha Community Church, a church that has it's fair share of scandal and things are about to get worse! Pastor Jason is new to the church, but that does not mean that everything is smooth sailing. A group begin to meet together for a Bible study, this is very different mix of people, however they are about to find healing, love and joy and becoming a part of the body of Christ. This book is filled with very realistic characters who the readers will empathize with and want to know more about. No group of people are immune to those who like to spread gossip and add to problems while trying to help. This is a quick read and one not to be missed for those who enjoy religious fiction. Innocent Emechete has compiled a collection of stories that were orally passed down through generations in Africa in the book, "Animal Stories Daddy Told Us." There are sixteen stories in this book that each have animals as their main characters. These animals all struggle and deal with issues that humans do as well, such as deceit and revenge. Each story has a lesson or moral to share with the reader. There are illustrations throughout the stories as well adding great detail to them. This book is not necessarily geared toward children as some of the lessons and topics are not really appropriate for young children. The stories would be a great tool to use with young adults in a creative writing class or in a class that focuses on culture, worldviews and morality. Each story has questions that are great to use for a discussion after reading each story. Book Review - "Kathryn the Grape's Colorful Adventure"
If you are looking for a book for young girls, then "Kathryn the Grape's Colorful Adventure" is for you! Written by Kathryn Cloward with Ginny Hornby and illustrated by Christine Winscott, this book is bold, vibrant and a great lesson! Kathryn feels unimportant and that her parents love her brothers more than her. Kathryn goes to her room feeling sorry for herself, but her mindset changes when her friend Maggie takes her on a magical adventure. With the aid of a charm bracelet and the various colors represented on it, Kathryn is able to learn how she is important and how to let who she is shine! This is a really fun book to read with your daughter or with a young girl who you may work with. Kathryn is able to think about and discover things she loves to do and how they make her feel and how she is able to shine in the world. This is a great resource to us to help girls boost their self-esteem and discover themselves. 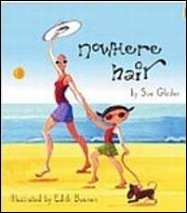 "Nowhere Hair" written by Sue Glader and illustrated by Edith Buenen is specifically for children who have a family member dealing with having cancer. This would be a perfect book for a child who has a mother or grandmother who is losing her hair due to cancer treatments. The girl's mother has been diagnosed with cancer and she loses her hair as a result of the treatments she undergoes. The girl is worried about her mom, wonders if the cancer is her fault and wonders where her hair has all gone. She is reassured that it is not her fault, and she sees her mom wearing all sorts of hats that help in numerous ways. This is a wonderful resource for children! It is an upbeat book, but it addresses the concerns and feelings that children will experience in this type of situation. Losing hair can be scary for children and this is a great way for it to be explained to children. 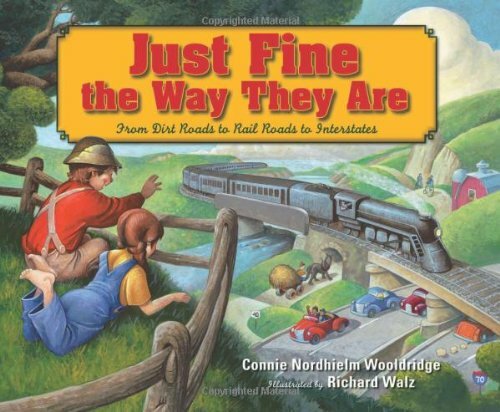 "Just Fine the Way They Are" written by Connie Nordhielm Wooldridge and illustrated by Richard Walz is an account of how the world has moved from having dirt roads to rail roads to interstates. John Slack, the tavern keeper, is happy with life and believes things are fine just the way they are with the rutted dirt road. Slack is resistant to the changes that congress and others want with building a main road and a railroad. With each change that comes along, it is believed that it is fine and travel is made easier and easier, but as time goes on there are always ways to make it even easier and better. Just as it is with many things today, some are resistant to change, but then when it occurs, the changes are adapted to and even appreciated after time. This is a beautiful account for children that displays how times have changed with travel through the years. The illustrations are beautiful and filled with details that children and adults will love to look at. There is a thorough time line included as well. This would be a great resource for elementary classrooms. Book Review - "The Amazing Adventures of Thomas and Erin with Granddad - the Zoo"
Thomas and Erin have another adventure with Granddad, this time it is a trip to the zoo! 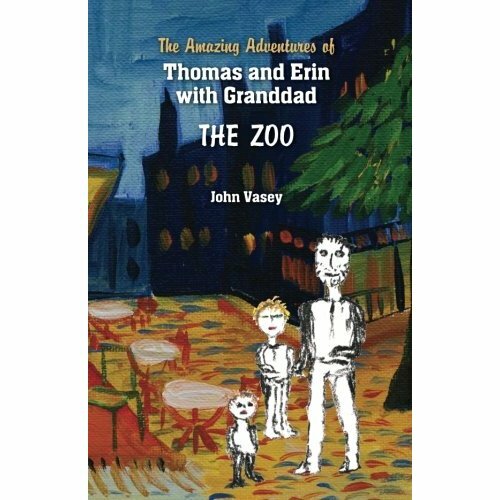 John Vasey's "The Amazing Adventures of Thomas and Erin with Granddad - The Zoo" is written and illustrated in the same style as his book describing their day at the market. Thomas and Erin are spending the day with their Granddad and they decide to go to the zoo. They get to see a variety of animals and interact with them and each other. This book is very simple book for children to read and enjoy. The illustrations go along with the story and they are beautiful additions to the story. This book is a great one for the reader to be interactive with the children he or she is reading with. There is a blank page at the back for the child to draw an adventure that he or she has had with granddad.